Discussion in 'General Discussion' started by Famous when dead, Feb 5, 2019. Lover-To-Be gets a vinyl release. SER: "Stay tuned" when asked about a release date on his FB page. Compared to the eleventh-hour digital only release of “Kiss Me A Lot” and it’s *cough* ...video..., this is a masterpiece of a release. Digging the red/Valentine’s Day colour scheme. Definitely will be a curiosity in the discography, though, if it indeed becomes a “double b-side” single. A single for California Son will probably follow shortly after. Has he cancelled a full European tour before? No, he hasn’t and he won’t. Just a couple of Berlin dates and Scandinavian dates does not a full European Tour make. He has cancelled a full South American Tour before, and it didn’t harm his popularity there one bit. A video for this track would be nice. 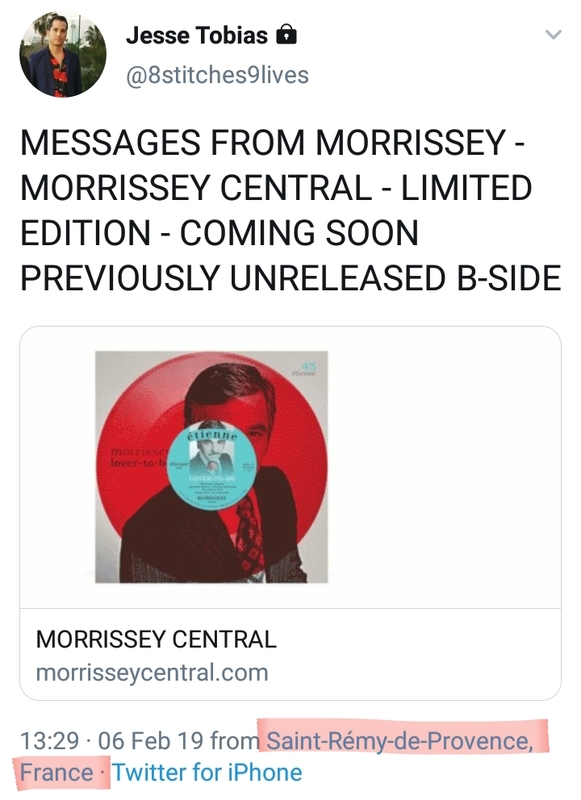 Maybe the B sides off California Son? Yes, there might be that Tim Buckley song in the can, if it ever was finished. Maybe Moz isn't for you and you should listen to Coldplay or the Backstreet Boys instead because your idea of good music appears to be based on how many units they sell. Not at all, my favourite band is Buzzcocks and they rarely set the charts alight. I’m also a big fan of Bob Mould who used be in Husker Du. Thanks for letting us know. Did you have cornflakes for breakfast? Are you having a good day? Any more interesting details like this and you will finally turn into MentalistUncleSkinny. California Son will be released much later in the year, yes. This will make him another vinyl number 1! number 1 ? Based on what? sales? pop song, but number 1 ? Some of his choices for a single are very perverse, there must be some personal reason for this single. Maybe just to have Donnelly Rhodes on a record sleeve gives him a chuckle. Please, don’t give Sam any ideas. Yes, this single may be just a way to generate a little news before the BMG wheels of promotion start to roll for CSon. Obviously I'm talking about something like his most recent videos for the LIHS era. Loved this song since the first time I listened to it. It's about the inevitability of sexual attraction between two people. Backstreet Boys? Oh my, aren't you well acquainted with the current music scene? I think he meant Menudo. limited because only about 100 people will want to buy it, no doubt.